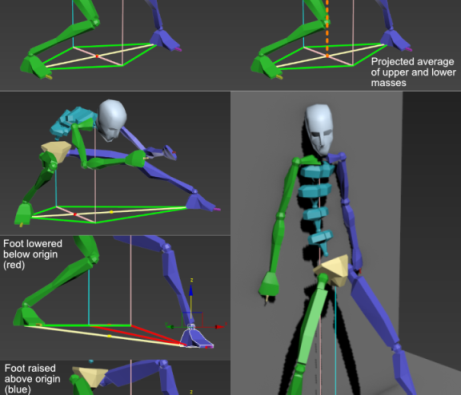 A tool for visualising the projected lower and upper masses (pelvis and base of the neck respectively) in relation to the feet of a standard Biped rig. Markers between the feet show where the masses intersect, which may help with determining where the static weight is distributed when posing. It does not take into account motion dynamics and so is mainly used for when standing still. Additionally, when a foot is raised above the ground it’s line markers turn blue. Likewise if lowered below the ground they turn red. Otherwise they stay green when level with the ground (+ or – 0.1 unit tollerance). Once installed, add the script as a toolbar icon. To add a Biped Mass Marker to a Biped, simply select any single Biped part and click the toolbar icon. After the markers are imported into the scene, a selection set is created containing the frozen markers. To delete the markers and selection set, hold SHIFT and click the toolbar icon.